This timeless Wheaton brick paved patio and pool deck project features Unilock Townhall Permeable pavers, which replaced a high-maintenance wood deck. Hardscape and landscape challenges were successfully addressed while providing an exceptionally beautiful and functional end result. Due to drainage challenges, it made sense for Landscape Creations to construct the new brick paved patio and pool deck using a permeable paver installation that would be self-draining. This application would eliminate any surface run-off or issues with standing water. There would be no need for a series of unsightly drains or a high level of maintenance. No existing landscaping or lawn was damaged during the installation, and the old wood deck was even recycled into mulch. 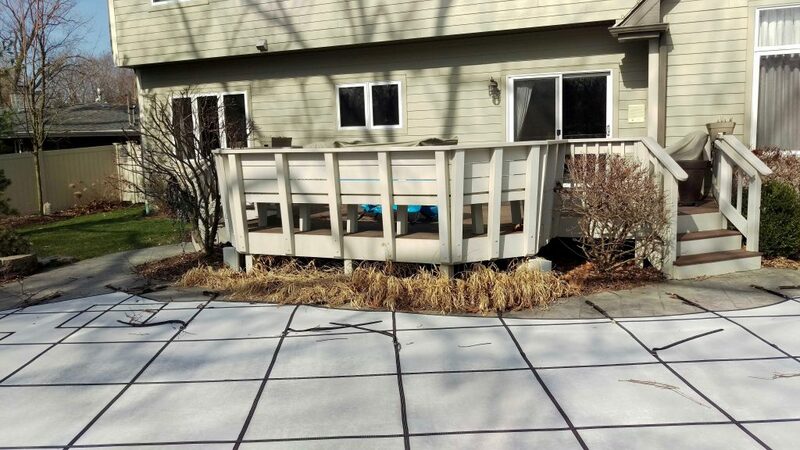 The below “before” photo shows the original wood deck, the additional featured photos highlight the finished project. 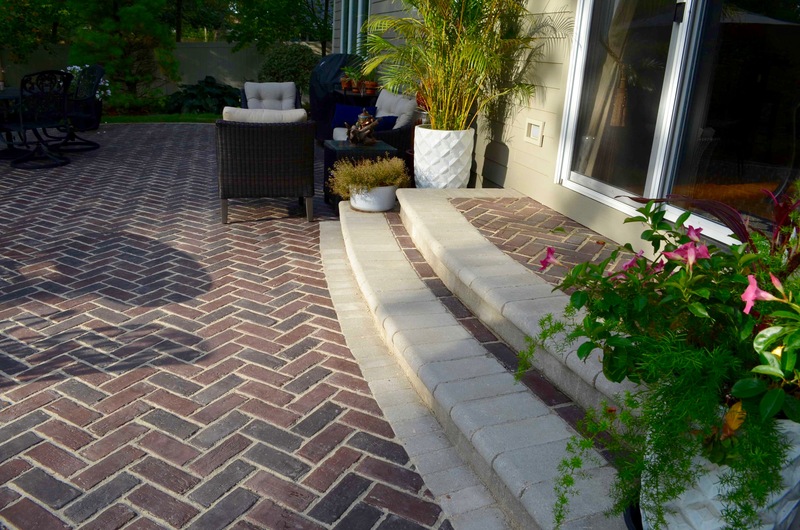 This Wheaton brick paver project not only facilitates drainage through the permeable pavers themselves, but also features open drainage joints between the pavers. These features enable water to flow through into a drainage gravel base. You’ll notice that the amount of outdoor living space for storage, grilling, and dining al fresco is also greatly increased. The materials utilized were Unilock Townhall Permeable brick pavers and Brussels Block Borderwork. Given the grade differences between the patio and finished floor of the residence, we formed and poured a concrete stoop, which was also covered with pavers. Unilock Townhall Permeable Brick Pavers. 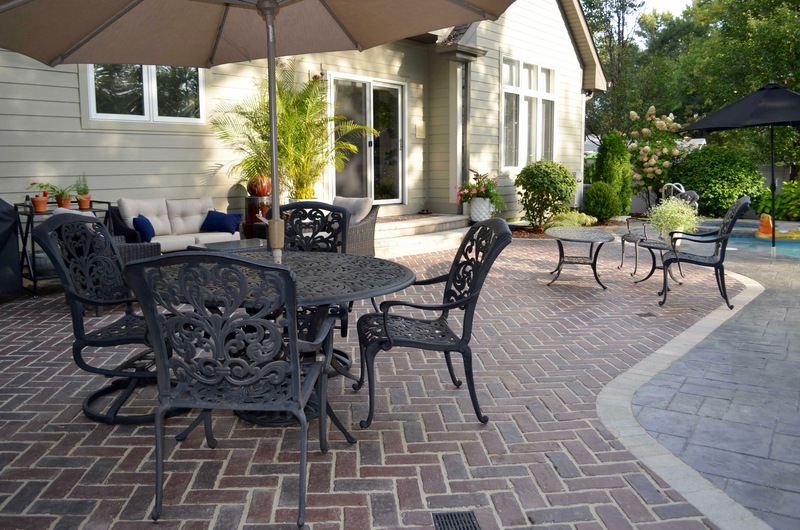 These pavers are cast from original brick street pavers and offer a distressed appearance. Brussels Block Borderwork. Made specifically for borders and accents, Brussels Block has a timeless warmth and relaxed appearance that reflect the look of quarried stone. Underdrain Drainage Tile. This type of tile would assist in draining excess water to a lower designated area. Unilock Easy Pro Epoxy Resin Jointing Compound. This is a special type of jointing sand that allows water to flow through, making it permeable, yet it still hardens like concrete or mortar. To get a customized quote from Landscape Creations of DuPage County, contact us today by calling (630) 932-8966.